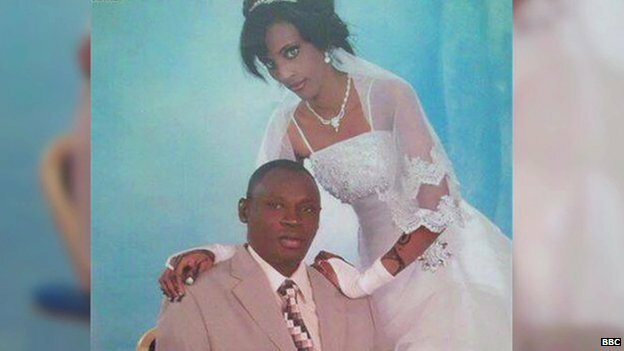 A Sudanese court has sentenced a woman to hang for apostasy – the abandonment of her religious faith – after she married a Christian man. The judge also sentenced the woman to 100 lashes after convicting her of adultery – because her marriage to a Christian man was not valid under Islamic law. Amnesty International said the woman, Meriam Yehya Ibrahim Ishag, was raised as an Orthodox Christian, her mother’s religion, because her father, a Muslim, was reportedly absent during her childhood. She was convicted of adultery on the grounds that her marriage to a Christian man from South Sudan was void under Sudan’s version of Islamic law, which says Muslim women cannot marry non-Muslims. There were small groups of protesters outside the court – both her supporters and those who back the punishment. About 50 people chanting “No to executing Meriam” were confronted by a smaller group who supported the verdict, but there was no violence. Amnesty’s Sudan researcher Manar Idriss condemned the punishments, saying apostasy and adultery should not be considered crimes. “The fact that a woman has been sentenced to death for her religious choice, and to flogging for being married to a man of an allegedly different religion is appalling and abhorrent,” he said. The BBC’s Osman Mohamed, in Khartoum, says death sentences are rarely carried out in Sudan. On Tuesday, the embassies of the United States, Canada, the United Kingdom and the Netherlands issued a joint statement expressing “deep concern” about the case and urging Sudan to respect the right to freedom of religion, AFP says. She is said to be eight months’ pregnant.